Our solar heating systems incorporate solar air collectors (solar heaters), solar panels and solar powered fans. They are designed to reduce your home or business heating costs whilst minimising your carbon footprint and improving the indoor air quality using solar energy. GES’ solar heating systems are based on SAM (Solar Air Modules) using solar powered fans to draw fresh air through a filter into the solar air collector. The sun will then heat the air before it is directed into the building. The design of this solar heater includes the extra benefit of it’s operation being controlled by the sun (in conjunction with a thermostat). This means that the solar heating systems only operates when the sun is out and will provide sufficient energy/heat to make a significant contribution towards heating in colder weather. Warm air from the solar heater modules will only be brought into the house when it is beneficial. In warmer weather the thermostat will prevent the SAM system from bringing warm air into the building. Read more about our energy efficient solar heating systems here. SAM may also be used to extract hot air or to introduce cool air at night! 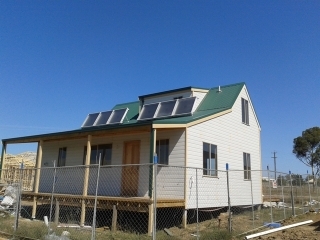 GES also offers an optional solar home cooling system, the In Ground Cooling System, which cools air down by pulling it through pipes buried in the ground before delivering the cooled air into the home. Read more about our solar cooling system here. With our solar heaters, we enable Australian homes to become more energy efficient and Australian families to live a sustainable and healthy life. Solar Heating should be a part of every sustainable house in Australia, both to contribute towards heating and to ensure a healthy indoor climate. This is often overlooked when building new energy efficient homes. Lack of ventilation may result in poor indoor air quality with symptoms such as condensation on windows. This leaves you with the need to reduce dampness and moisture content in the house in order to prevent mould and mildew from developing. Our sustainable solar heating and ventilation system will (cost) effectively address these issues. If you’re looking for solar heating systems and live in Melbourne, Sydney, Central Coast, South Coast, Gold Coast, Adelaide and Perth, then contact us. 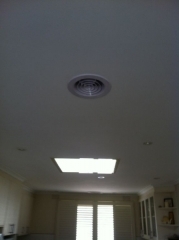 We’re happy to deliver and install all around Australia and have dealers waiting to hear from you all over Australia. To find your local SAM solar heater dealer please follow this link: SAM Dealers Australia or alternatively call GES on 1300 655 118 for further assistance. How Does Solar Heating And Cooling Work?